Seattle and Portland are the Northwest’s two largest cities. 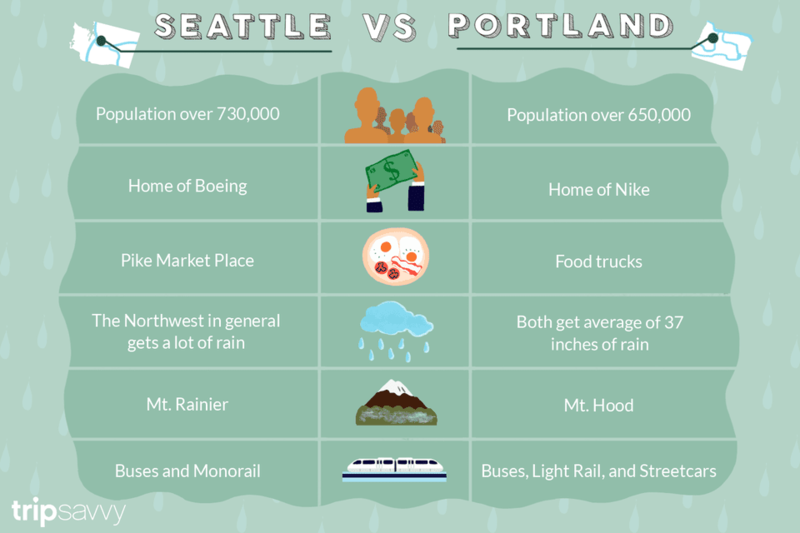 While there is some shared Northwest flavor between the two, there are also plenty of differences that make these two rainy metropolises unique from one another. And those differences make both worthy of a visit for different reasons! Whether you’re looking at living in Seattle or Portland, or taking a trip to one of these cities, understand what makes each city unique—from rainfall amounts, to cost of living, to transportation, to general atmosphere. While neither city is particularly formal, Portland has a slightly more laid-back vibe than Seattle. For some undefined reason, Portland feels a bit friendlier than Seattle, too. Stroll through either city and you’ll find people are generally polite, helpful, and approachable, but you’ll get that feeling just a little bit more in Portland than Seattle. Seattle is a tech hub and is filled with industry and a major port. While Portland also has a port and its own fair share of industry, it definitely feels (and is) a little smaller and a little quirkier than its neighbor to the north. Portland has a reputation for being weird (look for a large Keep Portland Weird mural near VooDoo Doughnuts) and likes to make sure it lives up to this reputation, from its street performers to its artsy vibe to its ample hipsters. You'll see efforts to keep up this weirdness most likely on your first day in the city, whether you see Darth Vadar with bagpipes on a unicycle or notice that the restaurant menus attempt to cater to every diet restriction possible (which, consequently, also makes this city a paradise for those with diet restrictions). Seattle has plenty of weird going on, too, but just doesn’t advertise its weird so blatantly. Portland's population as of 2017: 649,210 (source). Portland is slightly smaller than Seattle. While both cities have suburbs and other cities nearby, Seattle's metropolitan area is larger with other cities like Bellevue and Tacoma not far off. The result is one long metro area along the Puget Sound while Portland feels a little more suburban on its outskirts. Still, neither city feels huge as far as big cities go. Neither is exactly NYC or LA. Both are walkable and approachable...unless you're driving. The population will feel way higher during rush hour! According to Payscale.com, Seattle and Portland are in similar neighborhoods as far as average salaries go. Both cities have a full range of major companies from Boeing (Seattle) to Nike (Portland), as well as many start-ups and indie businesses working to create a dynamic employment scene. Seattle is home to major Fortune 500 companies like Amazon, Paccar and Microsoft. Both cities are growing and Seattle is known to have one of the hottest real estate markets in the country as of 2018 as transplants are moving to the area, in large part due to the growth of companies like Amazon. The Northwest is a foodie kind of place in general and both Seattle and Portland have thriving culinary scenes. You'll find less five-star elegance and more creative, fresh, local creations that run the gamut from food trucks to fancy in both cities. Special standouts on the culinary scene include Portland's food trucks (there are many!) and Seattle's Pike Place Market, which is filled not only with farm-fresh produce, but also restaurants of all stripes. It's a toss-up as to which city is the stronger culinary contender as you can't go wrong with either. You'll just have to head out to eat your way through both cities and decide for yourself on this one. Both cities are situated near the water. Seattle is located on the shores of Puget Sound (Elliott Bay to be exact), but also includes the shorelines of Lake Washington, Lake Union, and Green Lake. Portland is on both sides of the Willamette River and the Columbia River isn’t too far away. Both cities count large mountains as part of their scenery on sunny days. Mt. Rainier is visible from many parts of Seattle and is just 54 miles away. Likewise, Mt. Hood is just 50 miles from Portland. Mt. Rainier wins for height between the two mountains at 14,411 feet high to Mt. Hood’s 11,249 feet, but Mt. Hood has more ski resorts on its slopes than Mt. Rainier. Both cities have great parks systems, but Portland’s massive Forest Park has Seattle’s Discovery Park beaten for sheer size and wild appeal—but Forest Park doesn’t have a lighthouse with a view of a mountain and the Puget Sound! Residents and visitors of both cities will face no shortage of green spaces for urban hikes, places to walk the dog or just kick back on a park bench. Seattle and Portland both offer fairly extensive public transportation networks. In Seattle, look to the Metro buses for the best access to all areas of King County. Buses are supplemented by the monorail that runs between SeaTac International Airport and downtown Seattle, as well as from Westlake to Seattle Center. Buses also link Seattle with Tacoma to the south, and cities north such as Everett and Edmonds. Seattle’s buses are easy to use and safe to ride. Portland’s public transportation system wins against Seattle’s hands down. Portland’s TriMet system integrates buses with MAX Light Rail and streetcars. MAX lines run out to surrounding areas, including Beaverton, Hillsboro, Gresham and Portland International Airport. The Streetcar expands coverage to OMSI, Lloyd Center, Pearl District, and the South Waterfront area. Bus lines cover all these areas and more. While Seattle is working to build their light rail options, they just can't quite compete yet. Driving in both cities can be a bit frustrating to newcomers or visitors, especially in downtown areas. Expect congestion during rush hours as well as a dense street network with plenty of one-way streets to watch out for. Seattle and Portland offer different, but equally awesome attractions for residents and tourists alike. Both have a fair lineup of museums, including large art museums in each city. Both have shopping districts downtown with notable local shops - Powell's Books in Portland, Elliott Bay Book Company and Blick Art Materials in Seattle, for example. To meet Seattle’s Pike Place Market, Portland offers the Saturday Market (but Pike Place Market is open all week so it wins there). Portland’s Pioneer Courthouse Square is known as the city’s living room and can be a great place to hang out with a cup of coffee and check out whatever is going on for the day. Seattle’s Pioneer Square is not quite as inviting, but instead Seattle Center functions as the hub of festivals and many large happenings as well as a place to hang out. In addition to busy downtown cores, both offer all kinds of neighborhoods to explore, from low-key Nob Hill in Portland to creative Capitol Hill in Seattle. The Northwest in general is known for its rain, but residents of the area often like to say either Seattle or Portland gets more rain per year. Most people who casually speak on the subject don’t actually seem to know. The truth is that both Seattle and Portland get about the same amount of rainfall each year—37 inches on average. Both cities have plenty of cloudy days as well, meaning that it can be really tricky to pin down exactly how often you’ll see the sun. Stats about how many sunny days might not count partially sunny days, or sun breaks on cloudy days—but if you live in the area long enough, you’ll be plenty happy over a sun break for an hour or two in the middle of winter!